People have moved away from Mother Earth, bringing heartache, pain, and other maladies of the modern age. The “self-help” movement claims to offer peace and fulfillment to individuals, but this solitary approach takes us only so far. Ultimately, it is in communion with our fellow beings and the natural world that we are made whole. We need to leave the path of Me and follow the path of We. This poetic, evocative story presents the meditations of an ancient Anasazi tribesman who rejects his family and sets off on a journey through the desert. He walks seven paths, each teaching a lesson symbolized by an element of the natural world: light, wind, water, stone, plants, animals, and, finally, the unity of all beings with the Creator. 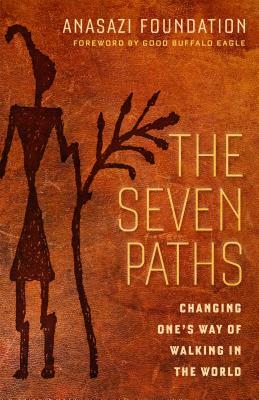 The Seven Paths reveals a source of wisdom, restoration, and renewal familiar to native people but lost to the rest of us, seven elements among nature that combine to mend human hearts. Founded in 1988 by renowned wilderness pioneers Larry D. Olsen and Ezekiel C. Sanchez (Good Buffalo Eagle), ANASAZI Foundation gives young people an opportunity for growth through a primitive living experience and a philosophy that invites healing at the hands of nature. —Ralph H. Earle, MDiv, PhD, founder and President, Psychological Counseling Services, Ltd.